As the world celebrates international Women’s Cycling Week, The Amy Gillett Foundation and Cycling Australia have launched the inaugural Amy’s Otway Classic, the sixth event on the Subaru National Road Series calendar. The event, run in conjunction with the Wiggle Amy’s Gran Fondo, makes its first appearance on the national calendar with riders set to tackle 110 kilometres from Lorne to Benwerrin, including a spectacular section along a fully closed Great Ocean Road on Sunday 14th September this year. 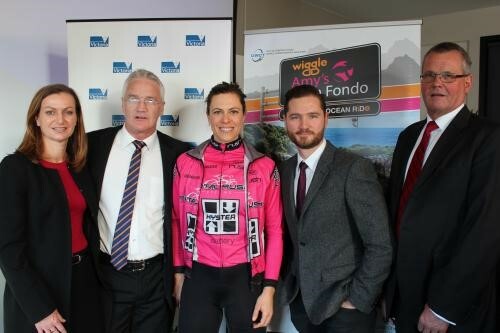 Both Amy’s Otway Classic and the Gran Fondo will benefit from support via the Victorian State Government’s Significant Sporting Events Program. Speaking at this morning’s launch, the Hon Damian Drum MLC, Victorian Minister for Sport and Recreation was pleased to announce the state government’s contribution to the events. In its fourth year, Amy’s Gran Fondo is held in memory of Australian cycling team member Amy Gillett, who tragically lost her life while training in Germany in 2005 when hit by a car. “I’m really looking forward to honouring Amy’s legacy and showcasing Australia’s best female riders on these iconic roads,” said 2014 national time trial bronze medallist Bridie O’Donnell (Total Rush Hyster). “I love the Great Ocean Road for riding, it’s the most beautiful stretch of coastal road in the world and we’re very fortunate that the Amy Gillett Foundation and Cycling Australia have been able to run the Gran Fondo over the past three years. So, I think it’s very fitting that this same course will be an NRS event for women in 2014,” explained O’Donnell. Elite women will begin their race one hour before the mass start of Amy’s Gran Fondo in Lorne, with riders travelling along the picturesque Great Ocean Road before a testing 10km Queen of the Mountain climb at Skenes Creek before concluding with another tough 10km climb to the finish line at Benwerrin. More than 5,000 recreational and competitive cyclists, all experiencing the safety and thrill of riding on closed roads as part of Amy’s Gran Fondo, are expected to descend on the Colac Otway and Surf Coast region for the event, which will also take in the Otway Ranges. Entries for 2014 have already exceeded last year’s entry numbers and Simon Gillett, Patron of the Amy Gillett Foundation, said Amy’s Gran Fondo is the only mass participation cycling event in Australia with full road closures, competitive and recreational elements and a safety briefing for every rider. “This is a once-a-year opportunity to ride your own Spring Classic,” Gillett said. And it is wonderful that we can now add a women’s National Road Series event to the program. It would be something that Amy would be thrilled to see happening, so it’s a great addition. Amy Gillett Foundation CEO Tracey Gaudry also expressed her delight at the new addition to Amy’s Gran Fondo. The Amy Gillett Foundation aims to reduce the incidence of death and injury of bike riders through safety awareness and education, and by influencing public policy with a mission of safe cycling for all Australians and a vision of zero bicycle rider fatalities. Amy’s Gran Fondo generates vital fundraising to support the Amy Gillett Foundation’s tireless efforts to promote shared respect between motorists and bike riders and reduce the incidence of death and injury of bike riders through improved conditions for cycling. All proceeds and fundraising associated with Amy’s Gran Fondo will be directed towards cycling safety research, advocacy and educational campaigns and programs.